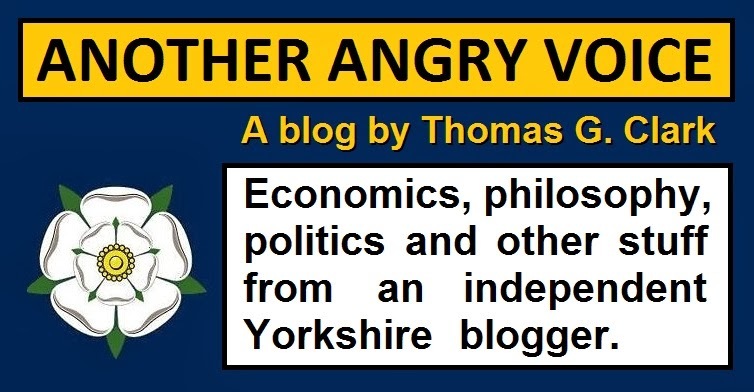 I'm not asking you to believe what I write here (even though it's all backed up with links to evidence). I'm not asking you to believe Jeremy Corbyn when he says that the NHS needs to be defended from the Tories with all of our might. I'm asking you to speak to someone you know who works in the NHS and ask them about a number of specific issues. Almost everyone knows someone who works for the NHS. 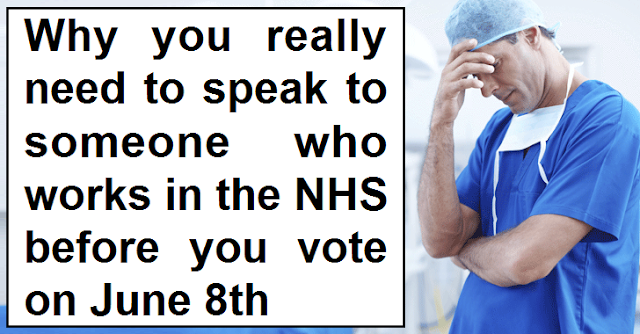 Everyone knows someone who knows someone who works in the NHS. If you have to ask a mutual friend to introduce you to an NHS worker so you can chat about the issues facing the NHS, I'm sure they wouldn't mind at all. They'd probably be very happy to meet someone who shows some actual interest in their work and working conditions. Ask them how they think the £20 billion in NHS cuts between 2010 and 2015 affected the quality of care the NHS could offer, and how another £22 billion in NHS cuts is affecting the quality of care the NHS can offer now. Ask them how they feel about the way the Tories introduced new rules to make it much easier for them to force the closure of NHS services without taking the views of local people or staff into consideration. Ask them whether waiting list times and waiting times at A&E departments have been rising, and whether they agree with the Tory policy of simply scrapping any waiting targets that are being missed instead of actually doing anything to address the problem. Ask them whether they think Theresa May's decision to scrap NHS bursaries has anything to do with the almost 10,000 decline in the number of people applying to study nursing courses this year alone, and whether they think the NHS recruitment crisis will get worse when the supply of new nurses slumps dramatically in a few years time because of the fall in trainee nurses. Ask them about NHS privatisation and how ever more NHS services being carved up and given away to profiteering private sector health companies like Serco, Virgin Health and (the major Tory party donors) Circle. Ask them how they feel about the years of below inflation pay rises for NHS staff whilst MPs bagged a whopping great 10% pay rise for themselves. Ask them how they feel about the Tories' £4.6 billion cut in the social care budget, and what kind of effect that is having on the already overstretched hospitals that are having to pick up the pieces. Ask them whether the junior doctors have been treated fairly and with respect by the Health Secretary Jeremy Hunt. Ask them whether Jeremy Hunt's comments that people should Google their health symptoms instead of seeking medical advice is a risk to public health. Ask them whether they share Theresa May's view that Jeremy Hunt has been "an excellent health secretary". Ask them if they actually know anyone working in the NHS who has confidence in Jeremy Hunt. Ask them about the £3 billion wasted on the massive 2012 top down reorganisation of the NHS that the Tories repeatedly promised not to do before they sneaked back into power in 2010. Ask them how they feel about the scores of A&E units, maternity wards, mental health facilities and NHS walk in centres that have been shut down by the Tories since 2010, and whether these closures have markedly increased demand elsewhere in the NHS. Ask them about the secret plans being drawn up to close even more A&E units, maternity wards and walk in centres. Ask them if their own primary care trust is in deficit. Ask them how they feel about the Tories going on about how much they care about mental health issues as they simultaneously slash the mental health budget and instruct their outsourcing contractors to specifically discriminate against people with mental health conditions. Ask them if they know any EU citizens who work in the NHS and whether they have left, or are thinking of leaving because of the threat of a ruinous Tory hard Brexit, and whether the 92% decline in the number of NHS nurses arriving from EU countries is likely to exacerbate the NHS recruitment crisis. Ask them how they feel about the Chairman of Conservative Health saying that the only way the Tories could bring in charging for NHS services is if there was a feeling in the country that the NHS is "falling apart". and whether the ongoing crisis in the NHS might actually be part of a deliberate Tory strategy to bring the days of universal health care to an end. Ask them whether them and their colleagues are increasingly stressed and overworked as they try to cope with increasing demand for services while funds and staffing levels are being slashed year after year. Ask them whether they think the NHS can actually survive if the Tories carry on like this.